If you have been researching companies that pay you to complete surveys, one thing you probably have found out by now is that they don’t pay much. Some companies may claim $1 per survey, while another may claim $5. And while these offers can add up and you could maybe make $20, $50 or even $100 a month, you’re not going to get rich in doing so. Plus, it can get frustrating getting denied for a survey after survey if you don’t meet the qualifications. So in today’s blog post, I wanted to talk about the ways you can potentially make $100+ per survey, all in a legit manner from scam-free websites. And no, I’m not like most who are going to sling the same old offer that doesn’t even come close to $100. While these opportunities won’t pop up every day, it can be possible if you meet the company’s demographic and know where to look. And… your chances greatly increase if you’re willing to interview in person at a local headquarters and join multiple panels. Commonly referred to as focus groups, these research companies will offer “surveys” in a variety of ways, from the comfort of your own home to the telephone or even at a local office as mentioned. As always, I try my best to offer legitimate advice and try to spew the same garbage online from other bloggers who just want to promote the same old offer. If you feel one of these resources or tips are not of use, then do let me know as I will research it more in-depth and consider the removal. NOTE: Before I start, keep in mind that some of these companies may require you to come to their office, but from my research, many have online-only options. However, your choices are limited if you’re not willing to travel. Just keep that in mind. 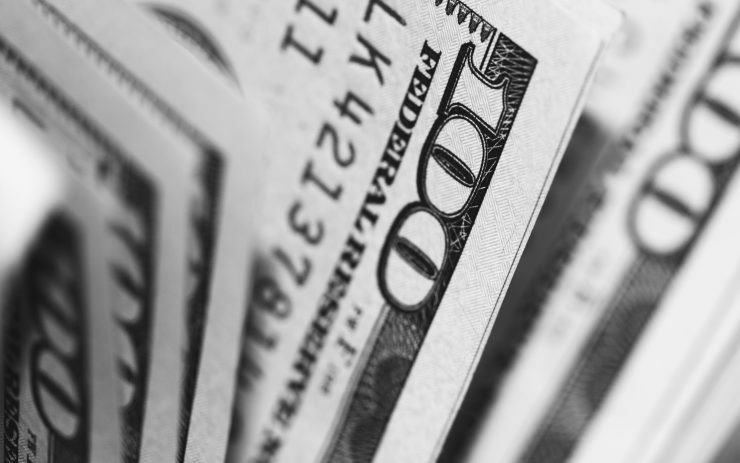 With all of this out of the way, here are some of the most popular companies online where you can find the highest paying online surveys as of today. 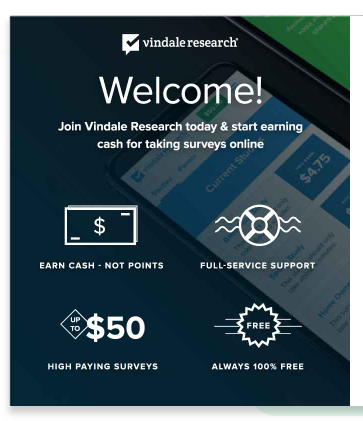 Vindale Research does not pay $100+ per survey, but out of most of the survey companies I joined, they offer “up to” $50 per survey, making it one of the highest paying “survey-type” site. And I just wanted to include them because I found a lot of people online recommending them for those who are looking for a lot of survey opportunities, with some paying a pretty decent amount. Now, one downfall, similar to a lot of these websites, is that they do send a lot of emails, asking you to qualify for a certain survey. And while some can offer low compensation, you will eventually find one that comes into your email inbox, offering you up to $50 or something close. These are the surveys you will want to look out for and qualify for. Joining is free, and if you haven’t done so already, I recommend you add Vindale to your list to make even more money, especially if you want an online-only option. To see the current signup bonus and the surveys as of today, you can do so here. While you won’t make $100+ per survey, you will find some surveys that may pay up to $50, according to the company’s official website. Like most surveys you may try to take on the various get-paid-to websites, you will need to qualify for the surveys first and there’s no guarantee you will get approved. But if you’re like me and join as many survey companies as possible, then I would add this company to your list as well since they do offer high paying surveys from time to time. Paying you in “points,” every point will equal a dollar, with the maximum amount being 5,000 points per survey or research project. Keep in mind, however, that these higher paying surveys will take you a lot longer than your typical $0.50, $1 or $5 surveys, sometimes as long as 90+ minutes. Just make sure it’s worth your time since you have to complete the survey in one sitting. Joining American Consumer Opinion is 100% free and you will need a $10 minimum in order to cash out. This shouldn’t be hard to do, however, if you solely focus on the higher paying surveys. Fieldwork, a professional research group company, is always looking for all types of people to participate in random research studies, both online as well as in person. If you live in one of these cities, then the company encourages you to join their database, but even if you do not, you can join the national database, which is open to everyone in the United States. Joining this national database may limit your selection, however. Now once you join, the company will then send you invites if your profile matches the particular research, and according to the company’s FAQ, they work with a variety of focus groups, including online research, phone interviews, in-home interviews, product trials and taste tests, to name a few. Like a lot of these focus group-like survey companies, you can get paid more than $100 for your time and the offers sent to you will greatly depend on your demographics. And if you just want to take surveys at home, that’s fine as well since you’re not obligated to participate in any offer they send you — it’s all optional and you’re able to choose what interests you. If you like the idea of focus groups, but you don’t want to attend one in person, then this is where Userinterviews.com could work. With User Interviews, I have read that, in some cases, they pay up to $250 per hour, but the sweet spot seems to be in the $50~ range. I only include them here since it could be well worth your time if you solely came to this post looking for ways to make $100 per survey. Now, the concept of Userinterviews.com is simple. Sign up on the website, fill out your profile, and when a project meets your demographic, the company will send you an email with a list of projects. And if you see one of interest, fill out the profile and if you qualify, you can get paid for your time. As you can see, the prices are all over the place, but if you do qualify, you can make quite a bit! Just read the description closely to make sure you match the demographic to save your time. If you find one interest, be sure to signup because the seats often fill up fast. Like Userinterviews.com, Respondent works in a similar way. First, the company will ask you to sign up, either with Linkedin or Facebook as a way to verify your employment background. 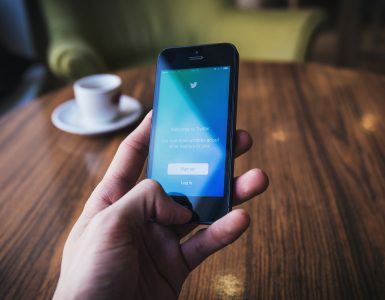 This can be a downfall for some, however, as this is the only way to sign up and some don’t like the idea of connecting their social media account. Then, after you apply, you will be asked to supply your contact details as well as fill out your demographic and employment profile. As another reputable option, it only takes a few minutes to apply, and if you do happen to find a survey, pay close attention to the details as some surveys may require you to drive to a specific location. I have read that some people had some luck getting as much as $100 for offering their input on music via Research.fm. Different from most of the companies I list here, the company, if you qualify, will first send you an invite to take a survey. And then, if you decide to do so, you will listen to and then rate the music samples on their server. Once done, you can then claim your reward in the form of an Amazon gift card. Signing up is free, and while it may be rare, $100+ surveys can occur, and if you’re a fan of music, then definitely add this one to your list. Now, don’t get mad at me here, but I found Mindswarms in doing my research and found out that they pay $50 via PayPal for every study that you complete. Close enough to $100, so I wanted to include them. So yes, I know it’s not $100, but for $50, it’s actually not bad for the time you invest. I’m talking as little as 10 to 15 minutes, so it’s going to be just as good as these $100 survey-type offers. First off, like any survey-like website, you will want to register on the website — it’s free. And once you do so, you can check out the available studies on your dashboard, which are waiting for you to apply. These offers will greatly depend on your demographics and the profile you fill out on the website, so be sure to add as much information you can to let the company learn more about you. The more they know, the more offers you could potentially receive. If you see an offer of interest, then the company will ask you to respond to the questions via video and in doing so, they will reward you $50 per response as long as it’s approved. Unlike surveys where you have to click endless buttons and offer your opinion, MindSwarms will want you to answer in form of a video, whether it’s from your smartphone, tablet or desktop. And from what I read, you just need to answer about seven questions and only takes about 10 minutes! So if you’re comfortable with the camera and want to help companies in their research, Mindswarms is a great company to consider. Engage Studies, according to its official website, is looking for anyone who is willing to offer an opinion on the products we have come to use every day. And according to the website, these companies will pay anywhere from $50 to $250 for your participation. With a wide range of topics, the company will send you invites, ranging from online discussions to paid focus group studies. So if you just want an online study, you could be able to find an opportunity. It’s free to join and they encourage you to answer a few questions on their free registration form. Inspired Opinions by Schlesinger, a pretty reputable company in the paid focus group world, offers a variety of ways to make decent money, from online surveys to participating over the phone. And if you feel comfortable meeting an associate at a local office, then they can offer even more opportunities. While the company doesn’t specifically state how much you can make, I did read on some various paid focus group-type websites that it’s not too hard to find studies paying more than $100+. Yes, while you do have to qualify, I highly recommend adding Inspired Opinions to see what kind of study you can take advantage of. I found Survey Squad while searching Twitter and it seemed as if they would blast out $100+ surveys quite often. 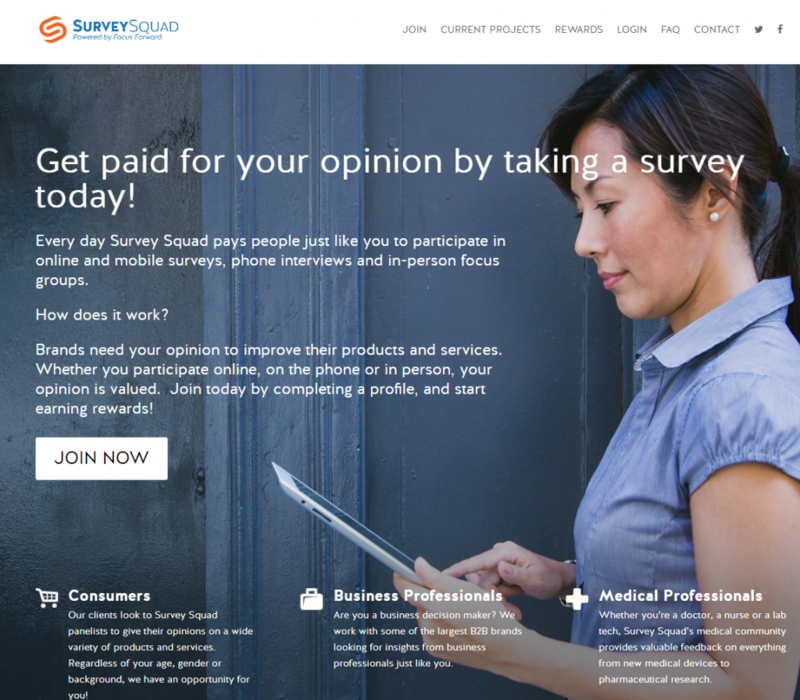 Joining is free, and whether it’s an online survey, mobile survey or in-person focus group, Survey Squad will contact you whenever they need your opinion. Again, it’s all optional and you can pick and choose what you want to participate in. And according to the company, they want you to apply, regardless of your age, gender or background since they have an opportunity for everyone. Unfortunately, some of your $100+ per survey opportunities will often happen outside of the home. And if you’re okay with it, you may want to look into companies who work with focus groups because these offers tend to pay a lot. In fact, I have participated in some in the past and have made as much as $250 for about two hours of my time, but remember, you do have to drive to the location and you need to often live in pretty busy areas. Most of the focus group companies I researched often were located in large metropolitan areas, such as L.A., New York and Chicago, for instance. FocusGroup.com, an opinion research company by Focus Pointe Global, offers focus studies across the United States in various cities. Join for free, fill out the profile and then respond to the surveys that are sent to your email. Now, you won’t get paid for the surveys sent to your email; rather, these companies are looking for a particular demographic. If the company likes you, then you be asked to either take answer survey questions line, attend a focus group or even a phone interview. As you can see, the payouts can vary, but some can be as much as $300! If you want to check out the studies before you even join, you can do so here. Probe Market Research is consistently looking for consumers who want to share their opinions about new TV commercials, beauty products and so much more. 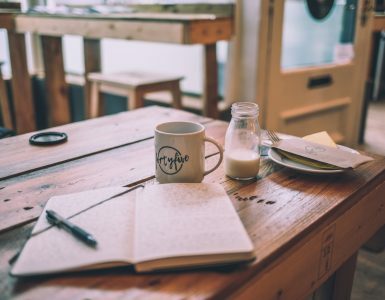 Paying upwards of $400 for a focus group-like study, the company notes that in some cases, you don’t even need to leave the home, making it a great option for those who want to stay at home. To sign up, it’s 100% free and the company simply asks for some general information such as your contact information, employment, household and so forth. Then, if a particular study meets your profile, the company will contact you with more information, such as the payout and what is needed of you. As a legitimate research company that has been around since 2005, the signup page is opened to residents in the United States. 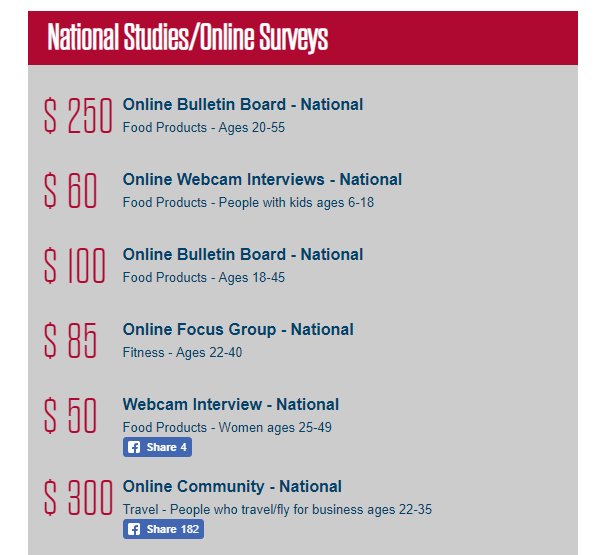 Via SIS International’s main website, they listed the current studies as of today, and I noticed that most were $100 or more, with some paying close to $300. And the great thing was that a lot of them were online. Joining the database is free, and there’s no obligation to participate if the company sends a request to your e-mail. If you live in one of the cities mentioned above and don’t mind visiting an office to get paid, then I definitely recommend adding this company for high-paying survey offers. However, if you can speak Spanish, served in the military and/or are a physician or nurse, then you can fill out a different application for even more opportunities. When you join, the company will invite you to participate in a wide range of opportunities, ranging from focus groups to taste tests and online surveys based on your demographic profile. Very reputable in the focus group community, considering signing up for the free panel to see what kind of invites you may receive. I personally do not have much experience with 20/20 Panel, but I did see some people on Reddit recommend this company as they can pay up to $300 per paid study. Like all of these resources, the 20/20 Panel is 100% free to join and it doesn’t hurt to join as many as possible to maximize your possibilities. 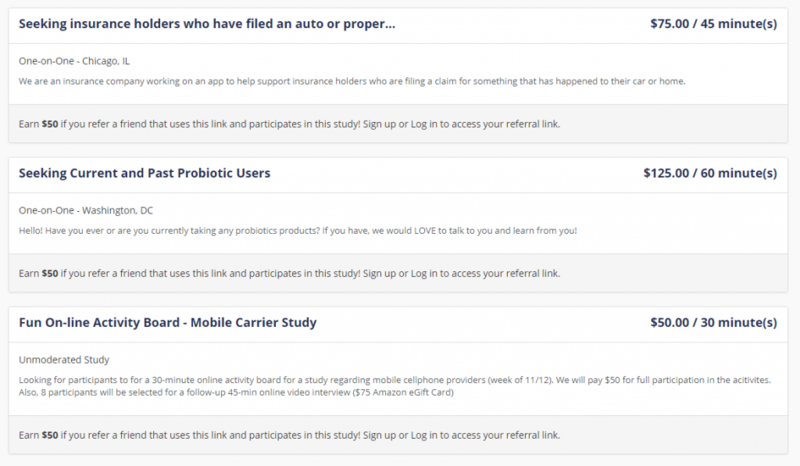 Since these resource groups often have different connections, the more groups you join, the higher your chances of snagging a high-paying survey/paid study is. With more than 40 research facilities in the United States, C&C Research invites you to register in a wide range of market research studies/surveys. Working a lot like these other focus group companies, the offers you receive via e-mail will greatly depend on your demographic and the researchers’ specific needs. When registering, just pay close attention to the physical locations as they will make you choose the closest to you since a lot of these studies will require you to come into the office to complete your study. According to the official Brand Institute website, they are seeking both consumer and pharmaceutical participants. And from what I read, these studies pay quite well, often as much as $250! To sign up, it’s 100% free and you can start your registration here. With prolific.ac, you can take part in exciting surveys and scientific studies from researchers around the globe. And according to the company, you will earn fair rewards and won’t be kicked out of studies after starting them, which is a common complaint among many who often consider these studies. Plus, you will earn CASH for your efforts, with no points or prize draws available. To get started, you can join prolific.ac for free by visiting the following registration link. Once you register, the company will reach out to you if they feel your demographics is a fit. Recruit and Field works with big-name companies, such as Microsoft and Google, and need your help sharing your personal opinion. Covering many products and services, Recruit and Field will invite you to participate in either an in-person study, phone interview, online survey or even send you a product to test, all while paying you top dollar. From the average consumer to business and medical professionals, joining is free and can be done so via RecruitandField.com. As a member of the Creative Consumer Research panel, you could receive invitations to participate in online research studies in the comfort of your own home. They also offer research opportunities at their local offices as well. You can find the office locations on their website. From paid travel to testing new products, joining the panel is 100% free. According to the Plaza Research FAQ, those who consider participating in one of their focus groups can average anywhere from $50 to $200 for a two-hour session or more than $20 an hour. And while it appears you will have to visit one of their offices, in a one-on-one or focus group-like setting, it could be a great way to make $100 an hour if you qualify. Like many of these research groups, however, they may offer online studies online, so it may not hurt to add yourself to the list to see what kind of offers arise. If interested and you live in one of the cities mentioned above, you can join the panel here for free. FindFocusGroups.com isn’t a company, but rather, it’s an awesome aggregator that searches for paid focus groups in the United States and breaks it down by either the city or nationwide. To use, it’s pretty simple. Just search by the city or state, and once on the list, you can scroll through the multiple focus groups that are active as of today. You can even set alerts if you want an email sent each time a survey is posted in either your hometown or nationwide. 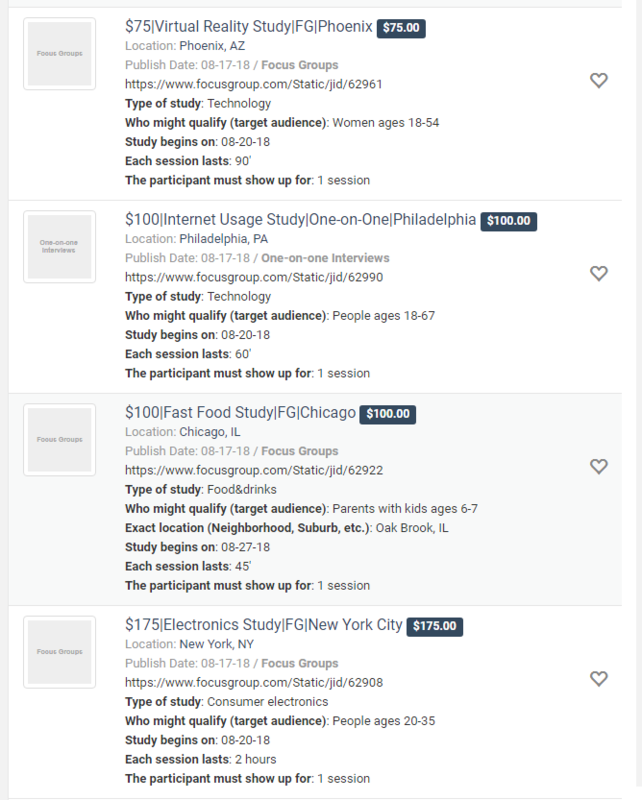 And next to each job posting, you can view the title, which is the subject of the focus group, as well as the location, when it was posted and the compensation. 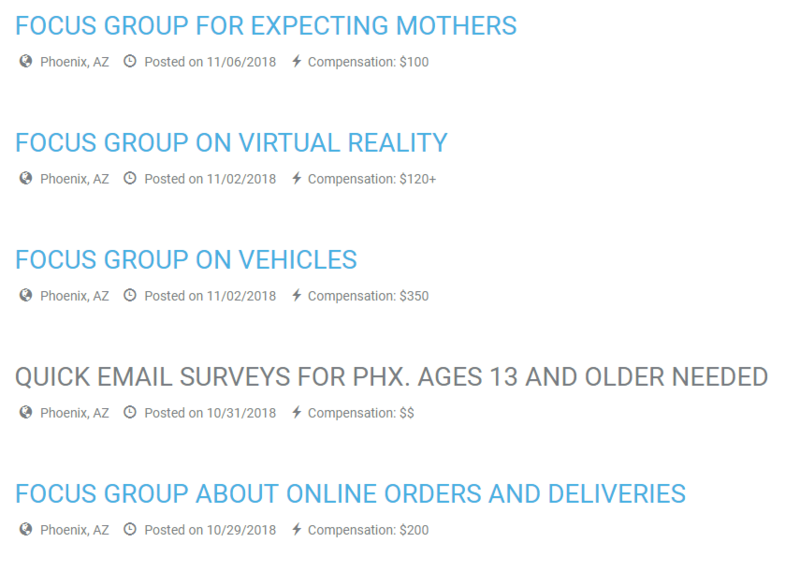 Living in Phoenix, Arizona, I thought I would check it out, and to my surprise, I found about 10+ groups which were posted in the last 20 days, all paying at least $75+. So if you don’t want to join all of the abovementioned research companies, this aggregator, as well as the ones mentioned below, could make it easier to find a good opportunity in your hometown. SurveyFeeds.com offers a variety of opportunities, ranging from paid surveys to research studies and focus groups. 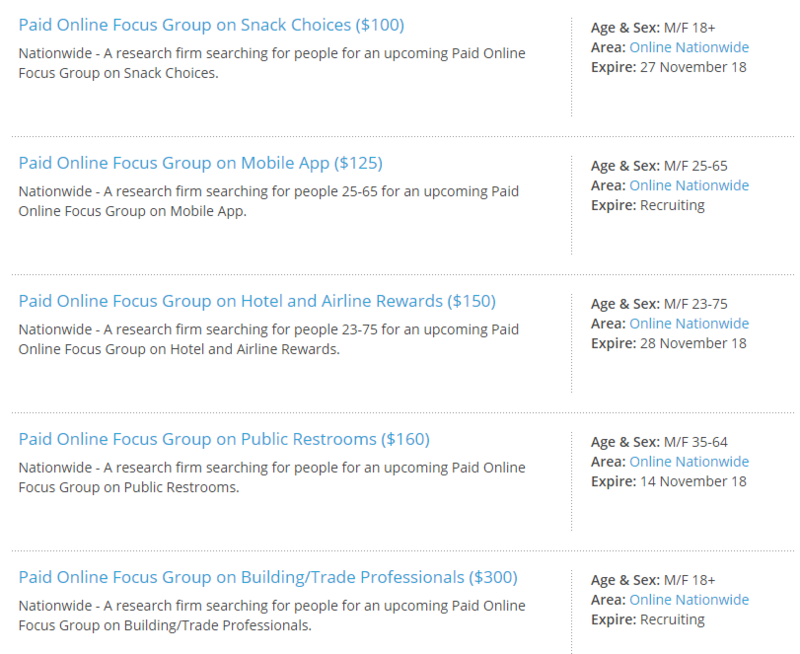 And similar to FindFocusGroups.com, the resource mentioned prior, SurveyFeeds will post advertisements from other research companies, acting as an aggregator, making it easier for you to find an opportunity that pays quite well. 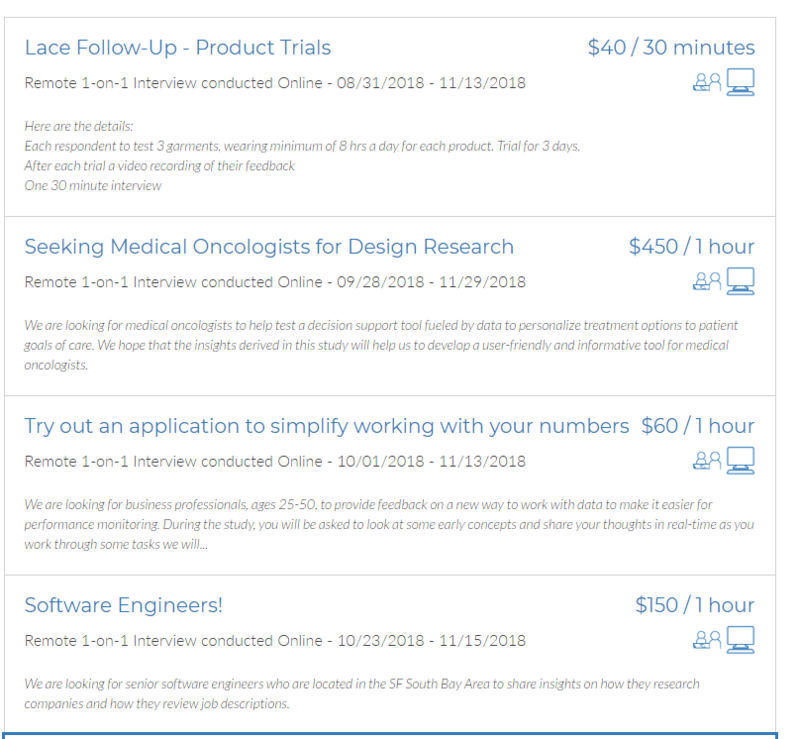 Whether it’s an in-person study or one in the comfort of your own home, when I took a glance, there were quite a few opportunities, with some paying as much as $300! Free to use, I liked this website a lot because they had a fantastic selection and I could break it down either by the city I lived in or if I only wanted online only studies. Again, this could be another great option if you just want to browse the most current studies and sign up for the one you qualify for. 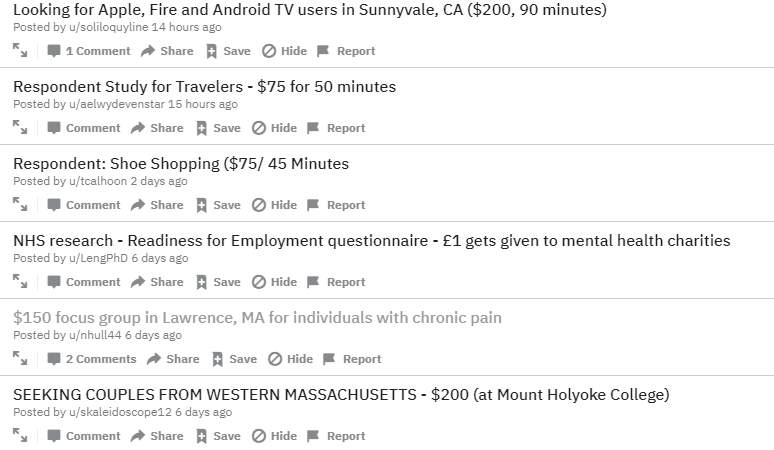 Whether you’re a member of Reddit or not, you can browse the most recent paid studies others found online via the subreddit, r/paidstudy. While some studies may be restricted to certain parts of the United States, members often do a good job explaining who the research needs in the study before you click. If you find a study of interest, click it, and in doing so, you should find yet another link you can click to take you to the study to qualify. Yet another paid survey aggregator, FGFinder.com will let you browse the current surveys available as of today. And the thing I like the most is that you can even search for just online surveys if that’s your thing. 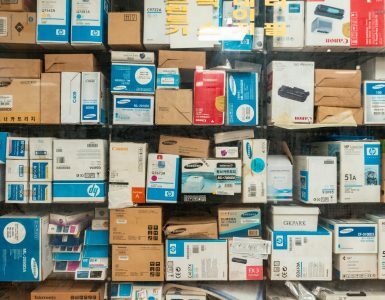 While the selection wasn’t as much as the prior resources listed, they did have about five pages, with surveys paying anywhere from $100 to more than $350! With these aggregators, I recommend you sign up for as many as possible to maximize my search. As my last option, your local Craigslist may offer a variety of focus group options. Now, if you go this route, these listings could come from a variety of people, so I would highly recommend you research the company’s reputation before applying. And if the company/individual doesn’t let you know who they are, consider this a red flag as it could either be a scammer or someone who wants you to answer their questions for free. You will find that some people will post affiliate offers, making it look like they are offering a focus group, when in reality, they are not. Your results will greatly vary depending upon where you live, but if you live in a heavily populated area, you may be surprised at what you could find. As you can see, you may be able to make up to $200+ for an hour of your time. The resources mentioned below are specific to certain cities, so if you live in one of the cities mentioned, then I would consider checking out the research company’s website to see if it’s worth joining. I will continue to add these as I find more. $100+ surveys are possible, as you can see, AND, the more research companies you join, the greater your chances of landing an offer can be. Plus, if you’re willing to travel to an office, it’s not too hard to get paid $100+ an hour for your time. Just join them and wait for the right e-mail to land in your inbox. Worst case, you can just delete and/or filter the companies you don’t feel are working out for you. I encourage you to join as many of these focus groups as possible, but before doing so, always make sure they are 100% legit as a lot of scams are floating around out there. Most of the ones I listed here were legit to me, but if you find other groups, which I’m sure you will, just research the company to ensure it can work for you. NEVER pay money to join a research company or provide your credit card number as a legitimate research company will never ask for this information. 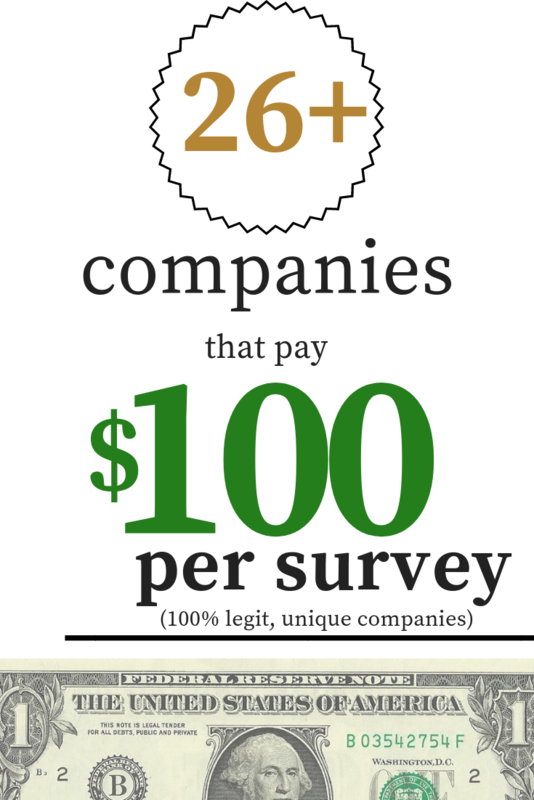 And of course, there are hundreds of other survey companies that will pay you for your opinion, but not as much as $100+. 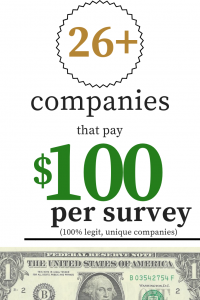 If interested, in additional companies that pay you anywhere from $0.50 to $10+ per survey, I encourage you to check out my top survey company list. I’m sure there are companies I missed. If so, let me know in the comments below. I would love to hear about them and even add them to the list!